Let's translate to our modern-day terminology. God said, "I live in heaven; it is My throne; I made the earth. It's a footstool before My throne. I am bigger than you are even capable of thinking. I am God." Stop and meditate on this. Perhaps you will catch a glimpse of His awesome glory! He created the earth and the universe. He positioned the stars with His fingers! Most of us do not comprehend the vastness of the universe. Because I have a background in engineering, I've researched some of the fascinating facts we know about the vastness of God's creation. 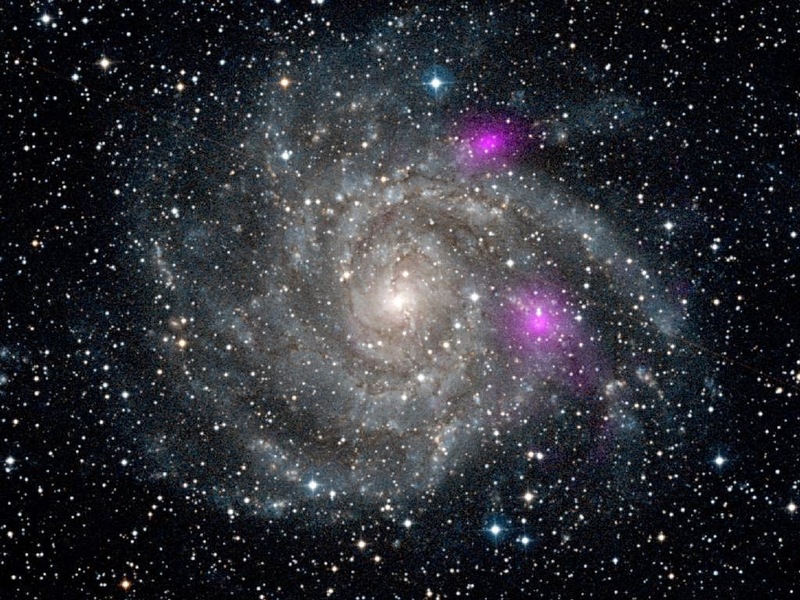 Light travels at the speed of 186,000 miles per second (not per hour but per second). That is roughly 700 million miles per hour. Our modern airplanes fly approximately 500 miles per hour. The moon is roughly 23),000 miles from the earth. If we were to travel to the moon by plane, it would take us twenty days. But light travels there in 1.3 seconds! Let's continue. The sun is 93 million miles from the earth. To reach the sun by plane, your journey would last over twenty-one years. Think of how long the past twenty-one years of your life has been. Then imagine flying that long without stopping to reach the sun! For those of you who prefer driving, it would take you roughly two hundred years, without any rest stops! Yet it takes light only 8 min­utes and 20 seconds to travel from the sun to the earth! The nearest star is 4.5 light years from the earth. To reach it by plane would take approximately fifty-three billion years! That is 53 with nine zeros behind it! Yet light reaches it in only four and one-half years! The average star you can see unassisted with the naked eye is 100 to 1,000 light years away. I wouldn't even attempt to calculate the amount of time it would take for a plane to reach it. But think of it: Light traveling at a rate of 186,000 miles per second takes one thousand years to reach the earth. That means there are stars you see at night whose light emanated from them in the days of King Richard's reign in England, and it has been traveling at the rate of 700 million miles per hour ever since, without slow­ing down! That light originated seven hundred years before America became a nation! Let's expand this further. In the mid-nineties NASA's Hubble Space Telescope sent back pictures of galaxies that were 7,000 light years away! Our minds cannot even comprehend distances like these. Are you getting a greater glimpse of His glory? Dear Lord, all we can say is WOW! Your glory is beyond what we can imagine. Thanks for all that You have done for each of us. In Jesus’’ Name, Amen. If something cannot be explained, it most likely is God-designed. Brian Jones and Bertrand Piccard had the hardest decision of their life to make as they entered the final leg of their journey with Orbiter 3. Bertrand was on the phone with his wife, his "weather eye," pondering if they should attempt crossing the Atlantic Ocean. Fuel was low for the 180 foot high Breitling Orbiter 3 after it had begun its historic journey sailing into the sky 2 weeks before from Chateau d'Oex, Switzerland. At the rate they were going, they would never be able to complete the journey. But his wife was trying to reassure him saying, "If you allow Orbiter 3 to go a few hundred feet higher, you will catch another jet stream. Just a few hundred feet," she had pleaded. In desperation, he fired up the burners, obeying her suggestions. With grandeur, the ship rose to 36,000 feet and into this new jet stream where the winds were 2-3 times faster, topping 230 miles per hour. They crossed the Atlantic quickly and soon were over the deserts of the Sahara landing near Mut, in south-western Egypt. On March 21, 1999, they landed, having covered 29,055 miles. With their fuel nearly spent and after riding the winds for 19 days, 21 hours and 55 minutes, the two pilots--Piccard, a Swiss psychiatrist whose grandfather invented the pressurized capsule for high-altitude ballooning, and Jones, a veteran British balloonist--took title to being the first balloonist to circumnavigate the globe, claiming the $1 million prize. "Did you sense something spiritual, an awakening or force in your trip?" They were asked. "If something cannot be explained, it most likely is God-designed." Just a few hundred feet higher. That's what did it! That's what could make it for you as well when you decide to sail past your limits and see a new life in God. Just a little higher and you may sense the finger of God working within your life, your capsule. If you step out in faith, spend just a little more fuel and reach just a little higher, you can reach that jet stream. You may be in the closing scenes of your desolate Sahara Desert but God can do a great wonder within you if you but ask Him into your life and take charge or control. It may be the hardest decision in your life but the prize is well worth it. This quote may be yours: If something cannot be explained, it most likely is God-designed. He is symmetric, sovereign and stupendous! Dear Lord, Help us to fly higher. Help us make the effort to not just go along but to give a little extra so we can reach greater things for you. In Jesus’ Name, Amen. Dear Lord, thank You that You know all about us. Help us completely trust You for everything knowing that You already know. In Jesus’ Name, Amen. Ann was a single mother of three living on welfare. She was often without funds to pay the necessary bills each month. Her income was $262 a month and she received about $350 per month in food stamps. Although food was usually in abundance, they often lacked necessities that could not be purchased with food stamps, like toilet paper and shampoo. They often had to compromise and were challenged to find creative alternatives . . . Like using Downy as hair conditioner. One summer, Ann found that she did not have sufficient funds to pay the electric bill. Disconnection was imminent. So, Ann packed up the kids (in the stroller, since she had no car) and began the all-too-familiar walk to the township trustee's office to once again seek assistance. When Ann arrived, there were several others sitting in the waiting area. This was not an easy task as many of the township employees looked down on them and treated them as though they had some sort of disease that they did not wish to contract. They were often treated rudely, with little patience or understanding. As Ann waited her turn, another young mother, Sue, with three children and a stroller entered the waiting area. Sue approached the receptionist and stated her need. She was out of food and would not be getting any money or food stamps for another week. The receptionist looked up the young mother's file in the computer. 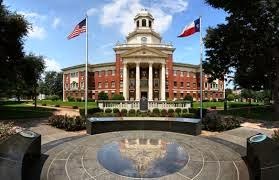 She then informed Sue that she could not have any assistance because it had not been long enough since her last visit. Ann immediately spoke up and said, "I can help you". Then Sue looked at Ann strangely. The receptionist looked at Ann even more strangely. She suspiciously questioned her, "If you can help Sue, why are you here asking us to help you?" Ann explained, "I have lots of food, but no cash. I can't pay my electric bill with food stamps." Sue was very hesitant but finally agreed to accept Ann's offer of help. When Ann returned from her visit with her case worker, Sue was gone. Hurriedly, Ann left the office and began going from street to street in an effort to find Sue and her young family. After about 20 minutes of searching, Ann finally found them and after some persuasion, she finally convinced the Sue to follow her home. When they arrived at Ann's house, Ann called a Christian neighbor who brought his car to help with the delivery. As Ann filled bag after bag with groceries, Sue expressed her thanks. She was in awe that Ann would share with a total stranger. They filled the car with groceries, baby clothes and a playpen that Ann no longer used. Sue was embarrassed, but Ann explained to her that we are all blessed with something that we can share with others regardless of how little we have. The Lord has blessed us each. How can you help someone today? Dear Lord, thank You for all you have given to us. Help us use what You have given to us to help others. Open our eyes to see what we can do today. In Jesus’ Name, Amen. Let the Lord Work Through You Today. Indeed, you need to be like the Lord. Almost 2,000 years ago Jesus died to save us from sin, death, and Satan. If the statistics are correct, there are hundreds of millions of people who don't believe in Him or the salvation He has won for them. Nowhere in the Bible do I see any sorrow on Jesus' part for having made the sacrifice He did. On the contrary, there is great rejoicing in heaven for every sinner who repents. We need to rejoice in the good the Holy Spirit does through us; we need to give thanks for every opportunity He puts on our plate. Dear Lord, thanks for all You have given for us. Help us be willing to give what we have so that Your name will be honored and the lost will be saved. In Jesus’ Name, Amen. It sounds simple, but putting it into practice is very difficult. We all have reasons for not giving money away, especially now when so many people are out of work completely, or earning reduced wages. But a principle is a principle, and it works all the time, not just when it seems easier to accept. Colleen W. knows it first hand and her story is typical of how most of us take the first step. Finances had been somewhat tight for Colleen. One day she received a letter from a woman for whom she had done a favor. Inside was a gift card for $25, along with a brief “thank you” note from the woman. Colleen was hadn’t expected to be paid, and she was thrilled. She couldn’t remember the last time she had received money that had no specific destination. The possibilities, although modest, seemed endless---something to wear? Something pretty for spring? She headed out to one of her favorite stories to enjoy some browsing time before making a selection. While wandering up and down the aisles, she passed a display of Easter bunnies and angels. And she thought immediately of Grace. Grace was a dear friend who was mourning the death of her son. He had died around Easter of last year, and the anniversary was approaching. How would Grace handle it, Colleen wondered? 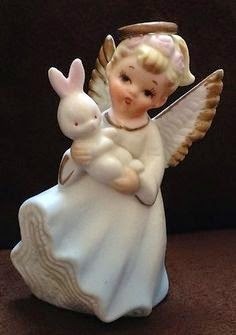 Grace had started a collection of angels and another of bunnies shortly after the funeral. “They just make me feel better,” she once explained to Colleen. Now Colleen was looking at a display of the same items, and…she moved closer. There was a statue of an angel holding a bunny. Just perfect for Grace. The price? A little under $25. No, Colleen thought. I can’t spend my gift card on something for someone else… But she could and she knew it. You will be repaid, said a voice in her head, but what did that mean? Quickly, before she changed her mind, she bought the statue, went home, wrapped it and left it on Grace’s porch. Colleen cried too then. She had definitely been repaid, as the words in her head had promised. What could be more enjoyable than making someone happy? God probably feels that way too, which is why Colleen received an unexpected check in the mail a few days later, from a utility bill overcharge. The amount? $25. Being a part of God’s answer to prayer? Priceless. Dear Lord, help our eyes be open and our hearts be willing to give. Help us be the one that You use today to bless somebody. In Jesus’ Name, Amen. 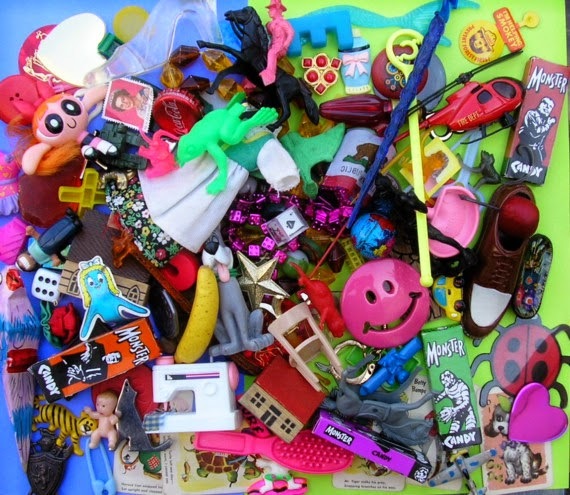 Do You Have a Pocket full of Trinkets? I read about a man In Ohio that sold automobiles. He had an incredible track record - selling to many of the same families for three generations. "What is your secret?" he was asked. "Why do you have so many repeat customers?" "Early in my career, I decided to make friends by giving things away," he told me. "Every morning, before leaving home, I made sure my pockets were filled with little trinkets - from ball point pens with the company logo to wrapped candy and key chains. I tried to give something to every customer." He said that while the parents were looking at the car, he would give their child a coin to put in the gum-ball machine. "I made it a point to give something to everybody." Why did it work? People never forget those who are thoughtful and generous. While you shouldn't give for the purpose of receiving, that is the way it usually seems to turn out. 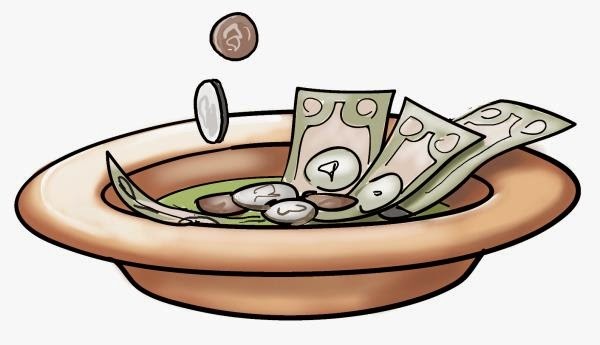 A generous donor was once asked, "How do you manage to give so much?" He responded, "The good Lord never stops shoveling good things on me. If I didn't shovel it back, I'd be buried in an avalanche!" It's been said that there are two kinds of people, givers and takers. The takers eat well, but the givers sleep well! Dear Lord, help us be givers. Help us look for ways that we can make someone feel special by giving them something no matter how small it may seem. In Jesus’ Name, Amen. Stanley Kresge was born on June 11, 1900 in Detroit, Michigan. He graduated from Albion College in 1923 and went to work for his father's company, the . 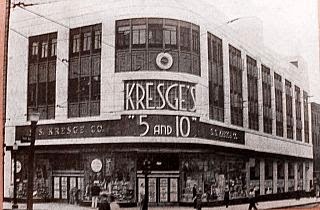 The S.S. Kresge Company later changed its name to K-Mart. For much of his entire life, Stanley Kresge was very wealthy man. But he was not spoiled by his inherited wealth. He was a Christian philanthropist who maximized that fortune. During his lifetime he gave away hundreds of millions of dollars to others, and especially to his church. When he died in Detroit at the age of 85, his pastor said this in the eulogy: "He considered what he had as a trust from God, and that he was a steward of all that God had given to him." Before his death, Kresge told a newspaper reporter why he never let it be known how much of his personal fortune he had given away. He said, "I'd be embarrassed to have anybody think I was bragging about charity." But quietly and consistently, all of his check payments and charitable contributions were signed exactly the same way: "In the name and for the sake of Jesus Christ, Stanley S. Kresge." We come into and leave this world with no material possessions. The only true measure of wealth is our ability to praise the Lord throughout our life. Are you going through difficult financial times? Turn to God. Dear Lord, help us be content with what we have and always take the time to praise You. Help us remember that what we have is from You. In Jesus’ Name, Amen. Do You Make Sacrifices With Joy? I read a story once about two wealthy Christians, a lawyer and a merchant, who traveled with a group that was going around the world. 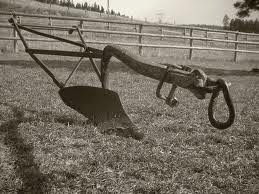 As they were visiting in Korea, they saw by the side of the road, a field in which a boy was pulling a crude plow and an old man held the plow handles and guided it. The lawyer was amused and took a snapshot of the scene. He turned to the missionary, who served as their interpreter and guide, and he said, "That's a curious picture. I suppose they are very poor." The guide replied, "Yes, that is the family of Chi Noue. When the place of worship was being built, they were eager to give something to it, but they had no money, so they sold their only ox and gave the money to the church. This spring, they are pulling the plow themselves." The men were silent for several moments. Then the businessman replied, "That must have been a real sacrifice." The guide said, "They do not call it that. They thought it was fortunate that they had an ox to sell." That story reminds me of a parable Jesus told: "The kingdom of heaven is like treasure hidden in a field, which a man found and hid; and for joy over it he goes and sells all that he has and buys that field." (Matt. 13:44). Notice carefully the words "for joy." This man doesn't just sell everything he has; he does so with joy. He doesn't regret it. He doesn't complain about the sacrifice he has to make. In fact, he probably doesn't even consider it to be a sacrifice. He gives a lot for the field, but he gets so much more in return. Sacrifice is usually difficult. Only love can make it easy; and perfect love can make it a joy. The same thing holds true in our walk with Christ. Sacrifices will be necessary, and only a deep love for Christ will make them a joy. The real test of our commitment is not so much whether we are willing to make sacrifices for our Lord, but whether we are able to make those sacrifices with joy. Dear Lord, help us look at the sacrifices that we make with joy. Help us give with a joyful heart as You show us to do. In Jesus’ Name, Amen. Dameon, the kid others teased, reached out his hand and stuffed 12 five-dollar bills into Jeff's hand. It was the Dameon's life savings. 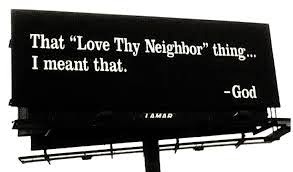 Dear Lord, forgive us for not loving our neighbor as we should. Help and seek to love them as the Lord would have s find ways that we can show love to them. In Jesus’ Name, Amen. Here is a story, reported to be true, about a nine year old boy who lived in a rural town in Tennessee. His house was in a poor area of the community. A church there had a bus ministry that came knocking on his door one Saturday afternoon. The child came to answer the door and greeted the bus pastor. "Jesus, I don't have anything to give you today, but just me. I give you me!" What will you give to God today? Dear Lord, we pray that we will be willing to give You some of what You have given to us. Like the Young boy in the devotion help us give our self to You. In Jesus’ Name, Amen. Rather than be insulted or discouraged by the "gift," Miss Berry bought a package of seed peanuts with it. The seeds were planted and tended, and they eventually yielded a large crop, which she later sold. Again she called on Mr. Ford. 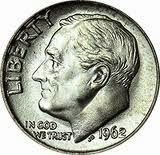 "Here's the dime you gave me last year," she said, handing him a coin. Then she told him of the return she had realized from his token investment. Now...how are your investments doing? Dear Lord, help us be willing to give what You have given to us to help others. Help us give with w willing heart. In Jesus’ Name, Amen. Are You Hooked on Giving? Dr. Mar Aprem of the ancient Chaldean Orthodox Church of the East in India, sometimes tells a funny story about when a member of the church won a lottery worth 100,000 rupees. His wife went to the bishop and told him that she was afraid to tell this glad news to her husband because he had a heart problem and any sudden excitement could cause a heart attack. The bishop offered to break the news gently to her husband. He visited the house and asked the man, "Wouldn't it be a good thing if you won 1,000 rupees in the lottery?" The man replied that he still would have to work to support his family. "What about 10,000 rupees?" the bishop asked. The man still showed no excitement, so the bishop carefully raised the amount to 50,000 and finally to 100,000 rupees. "If I got 100,000 rupees, I would give half of it to you, your Excellency," the man replied. The bishop had a heart attack, and the man called an ambulance. We can get excited about winning and getting. But have you learned how fun it is to give? Engineering and machinery genius R. G. LeTourneau discovered the joy of generosity. Besides establishing a private school, he reportedly gave 90 percent of his income to worthwhile causes, while living on the remaining ten percent. He became hooked on the fun of giving! Of course, money is not the only commodity that is fun to give. Give some time, give your expertise, give a smile or give your love. You can never run out of something worthwhile to give. Giving is fun. And there is no stopping those who discover it! Dear Lord, Thank You for all that You have given to us. 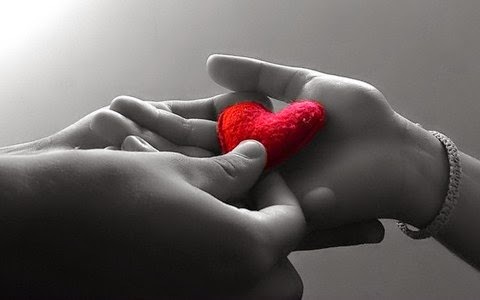 Help us have the heart to give unto others so that we may be a blessing to them and show Your love. In Jesus’ Name, Amen. 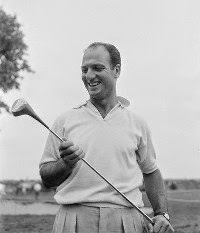 Robert De Vincenzo, the great Argentine golfer, once won a tournament and, after receiving the check and smiling for the cameras, he went to the clubhouse and prepared to leave. Sometime later, he walked alone to his car in the parking lot and was approached by a young woman. She congratulated him on his victory and then told him that her child was seriously ill and near death. She did not know how she could pay the doctor's bills and hospital expenses. Wow! What a beautiful spirit! I would have struggled with feelings of resentment. I would have said, "See if I try to help anyone else again!" Dear Lord, we pray that our hearts would be willing hearts. Help us to give wholeheartedly with love just as You have given for each of us. In Jesus’ Name, Amen. This was an exciting Sunday! I thought I would do something a little different and share what I shared at church tonight. Tonight we had the privilege to ordain two men as deacons. What a joy to be able to take part in such a meaningful service. Below is something I shared with a few changes so it fits the blog. As we see Scripture is more interested in the spiritual qualifications of deacons than it is in the details of their ministry. 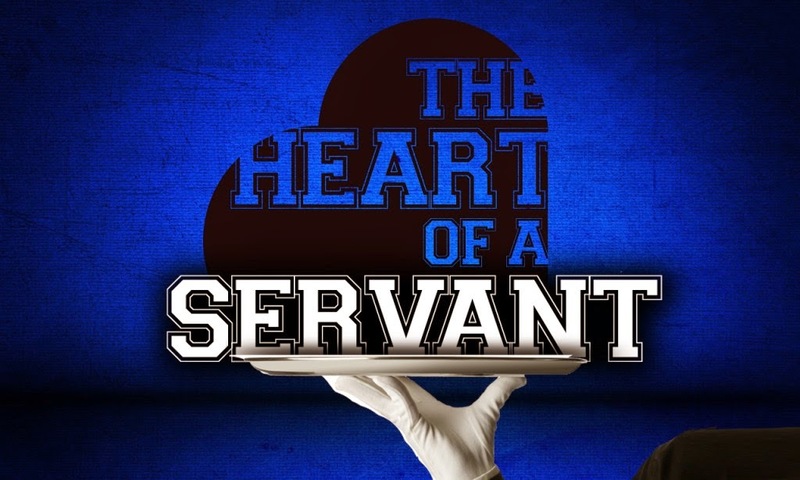 The word for deacon is servant, thus the core of their role is service. They are not called to control the church, but to lead through service. In I Timothy 1:10 it says they must first be tested. May we all find our self after the test to be found with sound Christian character, possess God’s grace, and to demonstrate a profound commitment to serve Jesus Christ. As we start a new week get ready for the test that you may be found a servant of Jesus Christ. Dear Lord, what a blessing it is to serve You. We pray that when we are tested that we would be found with sound Christian character, that we possess Your grace and that we would show a profound commitment to You. In Jesus’ Name, Amen. 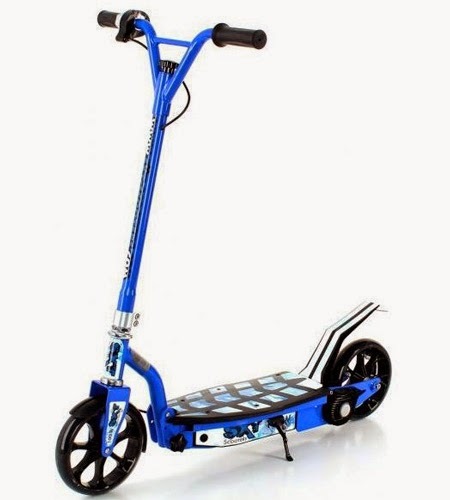 Grandma and Grandpa wanted to take their grandchildren to the toy store and buy them scooters with the spare change that they had collected for quite some time. Their spare change, collected every evening before going to bed and put in a jar, had grown to a whopping $450. The three grandchildren children went into the toy store and picked out scooters. Now all the children had "wheels." One of the granddaughters, Allison, has always had wheels on her wheelchair, being diagnosed with Cerebral Palsy at birth. Allison has always had a positive attitude. She had never let her disability get to her. Allison has always focused on her strengths rather than dwell on her losses. After the children were given their scooters, Allison's father, Richard, was about to begin the process of loading Allison's wheelchair back into the van via a motorized lift. Before he could load the van an urchin boy came up to the family with a plea for $2, money the boy stated that he and his mother needed for a motel room that night. As the adults told the boy that they had no money for him, the grandfather and Allison noticed a mother with a dog standing approximately 15 feet away. Allison quickly rode up to the boy and his mother in her wheelchair, opened her zipper purse, and gave the boy a $1 bill. The boy and his mother thanked Allison and let her pet their dog. Then Allison rode back to the rest of her family and said, "I am so lucky...lucky I remembered my purse today." Allison will not let her disability get to her. No matter what "cards are dealt to her," she always looks for the "silver lining." How do you look at your situation in life? Do you see the silver lining or do you see the troubles? Today why not make it a goal to be like Allison. Dear Lord, we pray today that we would not look at our circumstances and get down but that we would see the silver lining. Help us always be positive and look for the blessing that You give us. In Jesus’ Name, Amen. What is Your Ability to Give? In the summer of 1959, Robert Hill was a 13-year-old boy living in Italy. His father was a sergeant in the United States Army and was stationed there. Robert had just read of Dr. Albert Schweitzer's humanitarian works in Africa and he wanted to help him. Robert had only enough money to buy one bottle of aspirin. He didn't even have enough money to mail it to the doctor. But Robert wrote a letter to the Commander of the Air Force in Italy asking if "one of your planes" could just drop the bottle at the hospital. The Commander was touched by Robert's letter and passed it on to an Italian radio station. The station broadcast Robert's letter on the air. Soon thousands wanted to give to Dr. Schweitzer's work. In July 1959, Robert Hill flew to Africa with four and a half tons of medical supplies worth more than $400,000 carried in planes provided by the French and Italian Governments. 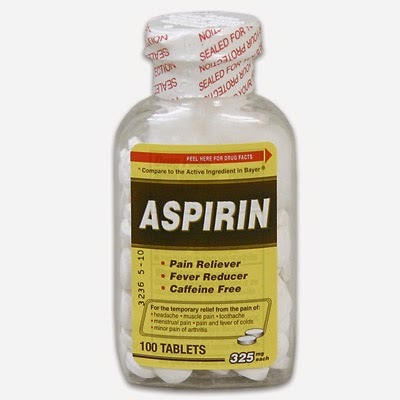 There were a great many persons who wished to give "aspirin" for Dr. Schweitzer's work. Dr. Schweitzer was touched by the display of compassion and said: "I never thought a child could do so much for my hospital." Dear Lord, thank the Lord for the opportunities You give us to give to others for Your glory. Open our eyes today so that we can see what we can do to help others. In Jesus’ Name, Amen. Do People See You as a Dragon? 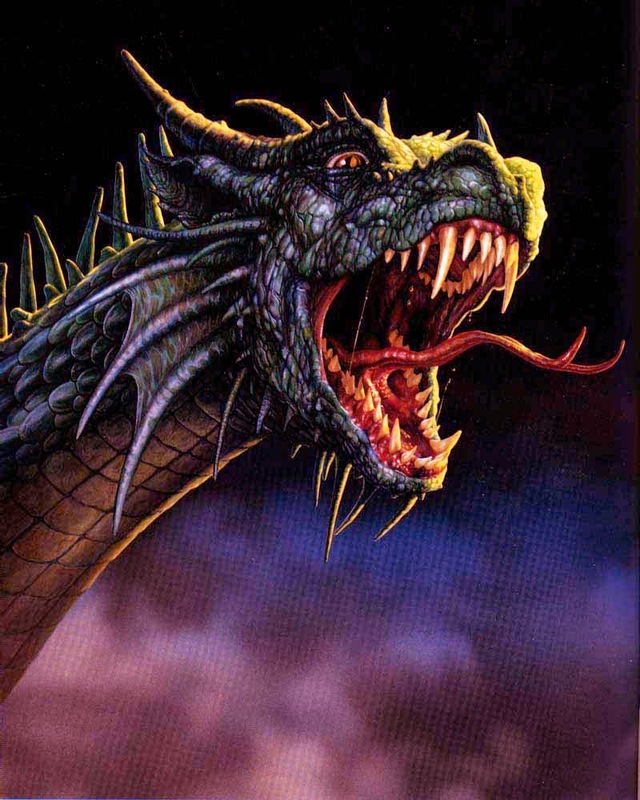 A poor vagabond, traveling a country road in England, tired and hungry, came to a roadside inn with a sign reading: "George and the Dragon." He knocked. The innkeeper's wife stuck her head out a window. "Could ye spare some victuals?" He asked. The woman glanced at his shabby clothes and obviously poor condition. "No!" She said rather sternly. "Could I have a pint of ale?" "No!" She said again. "Could I at least sleep in your stable?" "No!" By this time, she was fairly shouting. The vagabond said, "Might I please...?" "What now?" The woman interrupted impatiently. "D'ye suppose," he asked, "I might have a word with George?" Is it possible that people around us who are in need view us as a "dragon" because of our callous indifference to their plight? Oh, I know, I know. I'm sure many of you did what I did a few weeks ago at Thanksgiving. As you sat down to a sumptuous feast, you offered up a prayer to God for those "less fortunate." But did you actually do anything to help anyone? We live in a time when it's easy to be suspicious. There are some who refuse to work, preferring to live off the government and charitable organizations. There are some who seem to take joy in seeing how much they can get from naïve souls willing to believe their concocted "sob stories." But, there are also many around us in genuine need, and if we're not careful, we can come across to them like the woman above -- indifferent and uncaring. The scriptures have much to say about our attitude toward those in need. In fact, Jesus said that will be one factor which determines where we will spend eternity (Matthew 25:31-46). May we be known not only as a people who care, but as a people whose concern is shown through our actions. Take a minute today to reach out to someone with love today rather than respond like a dragon. Dear Lord, help our hearts be open today. Give us a spirit of discernment when those in need come to us. Help us be loving to them in our response. In Jesus’ Name, Amen. 1 “Be careful not to practice your righteousness in front of others to be seen by them. If you do, you will have no reward from your Father in heaven. 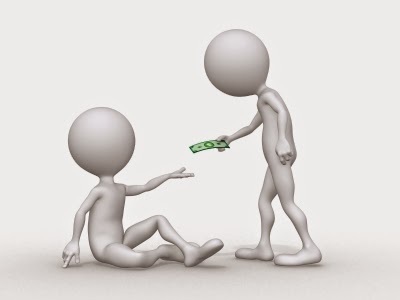 2 “So when you give to the needy, do not announce it with trumpets, as the hypocrites do in the synagogues and on the streets, to be honored by others. Truly I tell you, they have received their reward in full. Francis is called the little poor man of Assisi. He was born in the year 1182 in the town of Assisi in Italy. His father's name was Bernadone. Bernadone was a very wealthy merchant of Assisi. Francis was a very good-looking boy. He was merry and softhearted. So he had many friends. All the noble men's sons were his companions. Francis was brought up in luxury and gaiety. He spent a considerable portion of his wealth in extravagant pleasures. He used to drink with the young princes of the land. One day Francis was joking and laughing with his friends. A beggar came along crying for alms. Francis, who was softhearted, gave whatever he had in his pocket to the beggar. His companions mocked at him for his charitable act. Dispassion dawned in his heart. The sight of the beggar set him thinking about the poverty and misery of mundane life. He gave much money to the poor. His father thought that Francis was wasting his money and rebuked him. Sometime after this, Francis was laid up in bed for many months on account of some serious disease. He was about to die. But the Lord saved him, as he had to carry out a definite mission in his life. The nature of Francis was entirely changed. Francis prayed to the Lord for light and guidance as to his future. He had a vision of Lord Jesus. He made a strong determination to renounce his old way of living to tread a life of purity and to dedicate his life to the service of humanity. As soon as Francis got well, he informed his parents of his determination. They were disappointed. They became angry with Francis. Francis gave up his old ways and habits and set up to serve God. He distributed clothes, goods and money to the poor. His father was very much annoyed towards his son. He said, "Is this the gratitude you show to me? I labored hard and amassed wealth. You are lavishly wasting it on these miserable wretches". Francis' friends mocked at him and teased him. His father turned him out of the house. Francis lived like a beggar. His old friends even pelted him with stones and mud. He bore everything with patience. He wore a coarse dress and ate simple food. Francis lived in a cave in the mountains of Assisi and spent his time in prayer and meditation for two years. Some kind people gave him food, but very often he had to starve. Francis was humble. He loved God's creatures. He loved birds and beasts. He loved the depressed and the outcasts. He treated the birds, the beasts and all beings as brothers and sisters. Francis went from village to village preaching the love of God. He invited people to join him in his life of service if they were willing. Bernard, a rich man of Assisi, was very much attracted by the saintliness of Francis. He joined Francis. He was the first follower of Francis. He placed all his wealth at the altar of God. Eleven others also joined Francis. They distributed all their wealth to the poor. Francis and his followers went all over Italy preaching, teaching, healing and blessing wherever they went. The gospel of kindness and love of Francis soon spread all over Europe and earned for him the name of St. Francis. People called him the little poor man of Assisi. He lived forever in the hearts of all men. 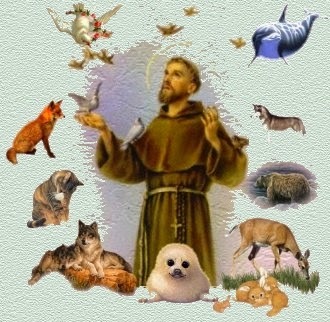 Glory to St. Francis, the little poor man of Assisi, but an illustrious saint! Are You willing to let God use you today? Dear Lord, we pray that You would give us the strength and courage to give unto You whatever You want us to do. In Jesus’ Name, Amen. Are You A Blessing to Somebody Today? Can God Use 57 Cents? Are You Letting Your Love Shine?